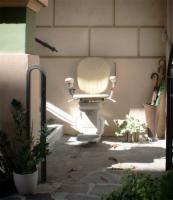 Our selection of stair lifts for outdoor usage combines the same AmeriGlide quality craftsmanship with specialized weatherproofed components and protective covers to ensure that your stairlift provides accessibility year after year, even in the harshest weather conditions. If you'd like further information about any product you see here, our accessibility experts are on call to assist you - simply dial 1 (866) 488-9802, or click here to contact us immediately via email. Check the Compare check boxes next to the Outdoor Stairlifts you wish to compare.